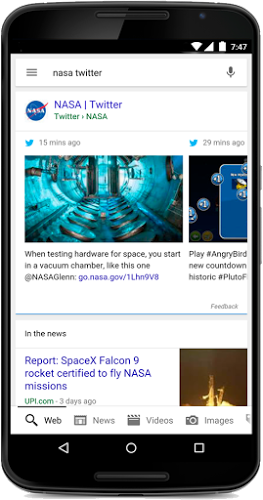 Google has announced that it is now displaying Tweets in searches conducted on mobile devices. The search update is rolling out gradually, first on Google apps and then on mobile browsers. With the update, real-time content from Twitter will be displayed directly in the search results. According to Google, this update provides a great way for users to get timely information about a specific topic. Moreover, it provides brands and organizations with a new way to reach a global audience with relevant content. It is important to note, however, that the update is rolling out in English first, with more languages expected in the future. Plus, Google says that it is working on bringing the update to desktops too. “Whether you’re interested in the latest from Taylor Swift, news about the #MadMenFinale, or updates on the NBA playoffs, you’ll have access to it directly from Google,” Google said in its announcement.